A number of authors and illustrators have made it their mission to foster a life-long love of art by publishing children’s book about art and artists. Beautiful works of art themselves, this selection of children’s books will educate and inspire budding art enthusiasts and the people who read to them. This book is about the life of acclaimed documentary photographer Dorothea Lange. It begins with her days as a rebellious student in New York and then as a budding photojournalist in San Francisco. The story follows her journey of documenting Americans during the Great Depression and World War II. 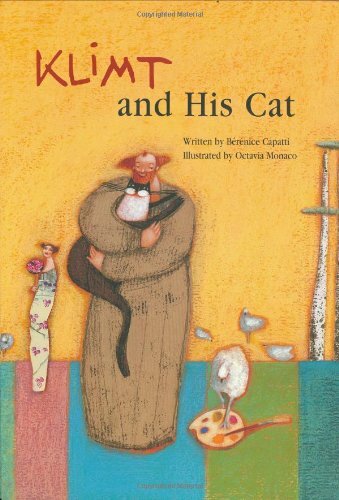 Inspired by the life of Mexican artist Frida Kahlo, this book is about her childhood spent with her animal friends including monkeys, birds, dogs, and a black cat, and how they influenced her art and life. A little boy visits an art gallery. He struggles to see the artworks through the tall crowds but discovers that art is everywhere—from the tattoos on other visitors, to the patterns of light on the floor. The book shows museums as wondrous places for children. Works by Piet Mondrain, Alexander Calder, and Henri Matisse are subtly illustrated throughout the text-free book. Master of the cutout, this is the story of Henri Matisse’s life from childhood, to his illness, and his path to creating his colorful paper cutouts. The book includes quotes by the artist and insights into his creative life. Told from the viewpoint of Gustav Klimt’s beloved cat, Katze, the feline takes readers on a journey through Klimt’s studio, tags along on vacations, and distracts his models, while providing insights on the artist’s thoughts and creative process. Gordon Parks’ biography is told through lyrical verse and atmospheric artwork. An African American photographer, Parks overcame racism and adversity to make a career as a fashion photographer, Hollywood director, and one of the most important photographers in the Civil Rights era. This is a great story about the power of photography for social change. Famed painter Georgia O’Keeffe’s fascinating life is wonderfully illustrated in this book. The story follows her childhood spent drawing, to her adult years in New York City, and painting in New Mexico. This is a great book about girls who grow up to follow their dreams. Written by the artist’s sister, this book explores the life and art of pop artist Keith Haring. The story revolves around the artist’s commitment to drawing on unconventional surfaces like sidewalks, walls, and paper hung from lampposts for follow his passion of sharing art with others. Written by MoMA curator Sarah Suzuki, this book introduces children to the colorful, polka-dotted world of Yayoi Kusama. The book tells the story of the artist’s journey to cover everything in polka dots including her paintings, sculptures, plants, the sky, and beyond while featuring her iconic artworks. Photographer and botanist Anna Atkins was the first person to publish a photography book. She recorded the plant life all around her in detailed illustrations and engravings until the invention of cyanotype photography in 1842. This book inspires young readers to learn about women in science and art and to use creativity in their lives. Vashti stares at a blank piece of paper in art class and declares that she can’t draw and is not an artist. Her art teacher encourages her to make a mark and the dot Vashti makes begins a journey of self-discovery. Wilson Bentley was the first person to photograph a snowflake. Growing up in Vermont, fascinated by snowflakes, Bentley followed his determination to use his camera to capture their wonder. When he did successfully photograph them in the 1800s, he learned that no two snowflakes are alike and each one is beautiful. Illustrated in woodcuts, this is a great story about perseverance in science and art. Winner of the 1999 Caldecott Medal. James Van Der Zee was an iconic portrait photographer in New York City’s Harlem neighborhood. Van Der Zee saved his money to buy a camera and photographed his family, classmates, and friends who would sit for a portrait. He moved to New York City and was told by his boss that no one would want to be photographed by a black man so he opened his own portrait studio in Harlem and went on to become a major figure in the Harlem Renaissance.